Improving my run speed was my top priority in 2013. After logging a season where I PRd every distance from 5K to marathon, I’ve shifted my focus to putting the pieces together: I want to run fast off the bike at my three long course triathlons this year. Despite a substantial dip in mileage since the start of my Ironman coaching in February – roughly 40 miles per week to just over 20, what I’ve lacked in volume I’ve made up for with quality workouts. At my first track workout last week, I posted a personal best 30 minute run by logging 4.6 miles (6:38 pace) as part of my lactate threshold assessment – roughly a 75% effort. 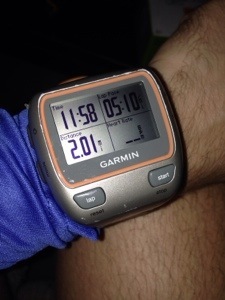 This week’s workout was a two mile time trial assessment – albeit an early season benchmark. Much to my surprise, I posted a 40 second PR overall, 11:58, and my fastest mile to date – 5:40. Most importantly, there’s a long season ahead and ample room for improvement. Happy Friday everyone! That is some serious speed. Awesome work! Whew, nice (speedy) work! I agree with you on cutting out the “junk” miles. I’ve found myself running too many of them and need to be cognizant of eliminating them from my training — even if it means a dip in weekly mileage. Congrats on the PR & good luck with the ongoing training. We really enjoy following along! Thank you so much! We are big fans as well. Happy running! Thank you! Couldn’t agree more – PRs feel amazing! 5:40, that’s so impressive. Congrats on that PR! Nice! That’s my goal for 2014, to start setting some new PRs!